Chromium(II) fluoride is an inorganic compound with the formula CrF2. It exists as a blue-green iridescent solid. Chromium(II) fluoride is sparingly soluble in water, almost insoluble in alcohol, and is soluble in boiling hydrochloric acid, but is not attacked by hot distilled sulfuric acid or nitric acid. 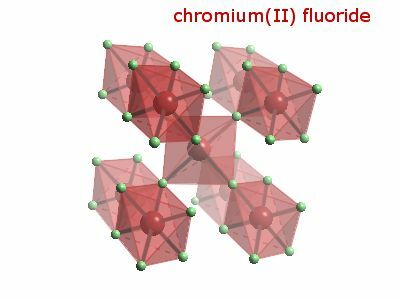 Like other chromous compounds, chromium(II) fluoride is oxidized to chromium(III) oxide in air. Like many difluorides, CrF2 adopts a structure like rutile with octahedral molecular geometry about Cr(II) and trigonal geometry at F−. Two of the six Cr-F bonds are long at 2.43 Å, and four are short near 2.00 Å. ^ a b c d e f Perry, Dale L. (2011). Handbook of Inorganic Compounds, Second Edition. Boca Raton, Florida: CRC Press. p. 120. ISBN 978-1-43981462-8. Retrieved 2014-01-10. This page was last edited on 23 February 2019, at 23:30 (UTC).